Josephs Coat rose belong to the types of roses known as shrub roses. Shrub rose types have received a bad name to the idea that they only flower once and are too large for the smaller garden. Some do only flower once, albeit for long periods, and some are very large. Many however are repeat flowering and not massively large. Within the shrub rose types there are related types of roses such as Alba, Bourbon, Centifolia, China, Damask, Tea, English, Gallica, Hybrid Musk, Moss, Noisette, Rugosa and several others. Josephs Coat rose belongs to the rose types known as Modern Shrub rose. 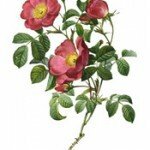 There are approximately 20 different types of roses belonging to the category of modern shrub roses. Modern shrub roses contain all sorts of colors, shapes and sizes. Some are repeat flowering other just flower once. Some are single bloomed, others double. The only clear link between these types of roses is the fact that they were bred in the 20th century. Named after the biblical character, Joseph, and his coat of many colours, this rose type provides an array of colours throughout the season. Josephs Coat is at its peak in June/July. It has medium sized blooms borne on large trusses. These blooms are yellow with red edges, semi-double and very slightly fragrant. As the blooms age the color changes from yellow through orange to finally, a cherry red. It will keep flowering with colour variations all the way until first frosts. It is repeat flowering with dark green foliage. It will take a few years for this type of rose to reach its full glory. Unlike many climbing roses it is eay to get this rose to flower down at the base so you don’t get that "bare legs" look. It does prefer full sun and is reasonably disease resistant. Many growers have reported difficulty in growing this climbing rose in harsher climates. Some have started growing Josephs Coat on its own roots and are reporting a far superior plant than the more generally available grafted plant. How to Prune Climbing Roses. 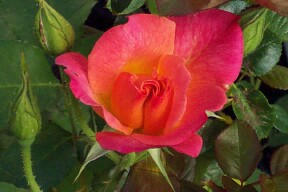 Newly or recently planted climbing roses do not need pruning. You only need to remove dead tips. Pruning climbing roses that are established can vary depending on which variety of climbing rose you want to prune.